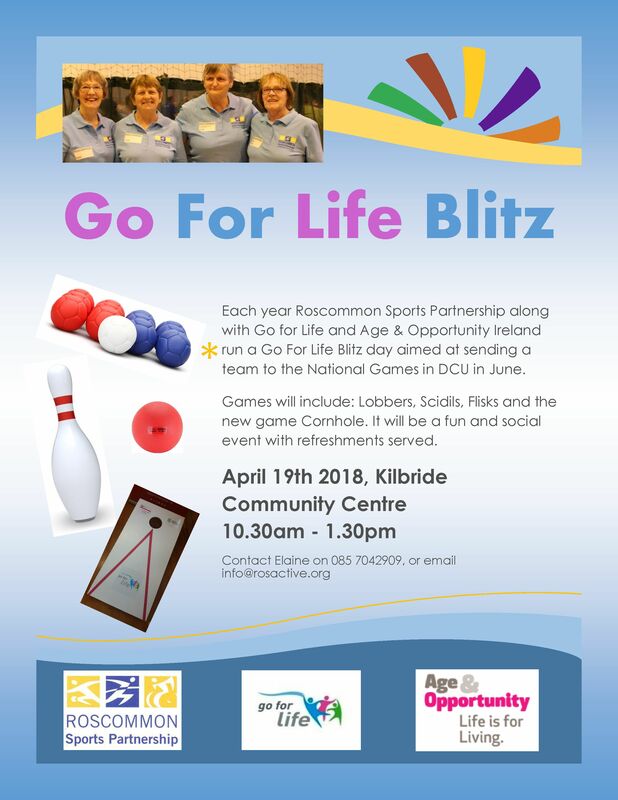 Roscommon Sports Partnership will be hosting a County Go for Life Games Blitz from 10.30 am - 1.30 pm, in Kilbride/Four Mile House on Thursday, 19th April 2018. All Active Age groups are invited to come along and play the games of Flisk, Scidils, Lobbers along with the new game called Corn Hole in a friendly atmosphere. There will also be refreshments served. If you are interested in attending can you please let us know. The National Go for Life Games Event will take place in June with a date yet to be confirmed, in Dublin City University. Each County team would have 12 members and a manager. It is a full day event, from approximately 10 am to 4 pm, with lots of refreshment provided and dinner. We normally organise a bus to go from Roscommon if anyone is interested.